Save Room, (later tonight) There’s Pie! Hello all! Sorry for the hiatus. Last week was the first real week of graduate classes. I’m still trying to master the balance between working during the day and taking some time in the evenings to check in on my class discussion boards. I’d prefer to make my schedule somewhat regimented, but I don’t want to over think it at the same time. At any rate, this semester is somewhat of an experiment, and hopefully I’ll learn what I can and can’t handle in terms of a workload. This weekend was full of good things. Saturday night we went to Wolftrap to see Les Miserables with Joe’s parents. Fortunately, the remnants of hurricane Hanna dissipated in time for the performance (it was at an outdoor pavilion) and we ended up with perfect evening weather. The production itself was very good. Les Mis is one of my favorite shows, so there were lots of particular scenes/songs that I was looking forward to. The cast did not disappoint. The gentlemen playing Valjean and Javert had near-perfect antagonistic chemistry. 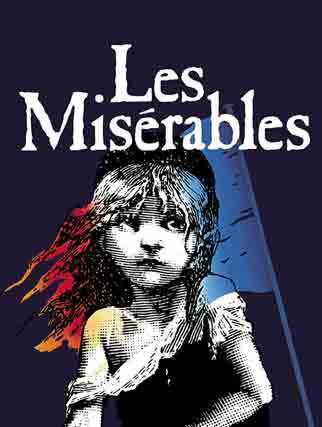 Vocal-wise, I felt the strongest players were the actors portraying Valjean, Javert, Enjolras, and (surprisingly) Marius. I’m not usually a fan of Marius’ character as the love-struck student. If an actor isn’t careful, the role can come off as fickle (in my opinion), but that wasn’t the case. In fact, the song in which he eulogizes his friends, “Empty Chairs At Empty Tables” was my favorite solo vocal performance of the evening. As for ensemble numbers, they were all well done, but “Do You Hear the People Sing?” and “One Day More” were outstanding. They’re both those kind of big ensemble numbers that get your adrenaline going. Going to the theatre is somewhat bittersweet for me at times, and Saturday night was no different. There is still a part of me that wishes I’d stuck it out as a theatre major and tried to make my name in New York City. I miss performing a lot, and hearing the songs that I used to sing in voice class makes me nostalgic for it. Saturday night particularly made me remember performing “At the End of the Day” (another Les Mis ensemble number) with my group voice class when I was about 13 years old. I couldn’t help but smile when I thought about that group of people. It still makes me chuckle remembering that we only had one boy in the class, so he and I always ended up singing tenor in the group numbers to balance out the sopranos. Thinking about that in conjunction with what I’ve been learning in my Information and Society class really helped me to get a better grasp on the concept of how things link together through a common thread. As humans, we categorize and organize facets of our lives in order to create better wayfinding methods. By wayfinding, I mean the things we use, know, and do in order to get from one place to another. For instance, the Folger’s main webpage has many links to the various current exhibits, publications, and visitor information. Each of those subpages has links to more specific subpages and a link back to the main page. In navigating those links (like watching road signs) we essentially follow a path that leads to the information we seek. Now, what does this have to do with thinking about my past theatre experience? Well, haven’t you ever gotten lost in your thoughts, or had a conversation go off on a tangent only to step back and think, “Wait, how did I/we get here?” In my case, thinking about that group performance made me realize how much the Pittsburgh CLO became the “main page” that “linked” me to many of my future theatre endeavors. It was someone in that group of people that told me about CLO’s choir, which I joined and performed with for a while. Then, someone in the choir told me about auditions for Bye Bye Birdie, which I went to and ended up performing in the following summer. That experience led me to finally taking private voice lessons…and so on and so forth. It wasn’t until after I’d followed the path to the end of high school that I realized I was doing a sort of historical wayfinding to understand how I’d ended up where I was. And to be honest, it made me feel better. It made me remember why I’d made the decision to pursue English as a major in college and why I’d decided that the performance life wasn’t for me. I still felt the happy nostalgia, but the lingering pang of regret was gone. Finding the information I sought brought resolution, as does any fruitful research (hopefully). Once again, I find myself thrilled to have this blog. Now writing here is even keeping me thinking about the concepts I’m learning in school. Since I haven’t updated in so long, I decided that I’d make something extra special and tasty to share. Unfortunately, the pictures are at home, so you’ll have to wait just a little longer. Like the title says, “Save Room, (later tonight) There’s Pie!” and tonight I promise to post a recipe for Apple Pocket Pies that I promise is delicious and full of whole grains and protein. I hope everyone had a wonderful weekend and that your Monday isn’t too terrifying. Ciao for now!